These earrings will make a great everyday earring or a sparkly addition to a night out on the town. 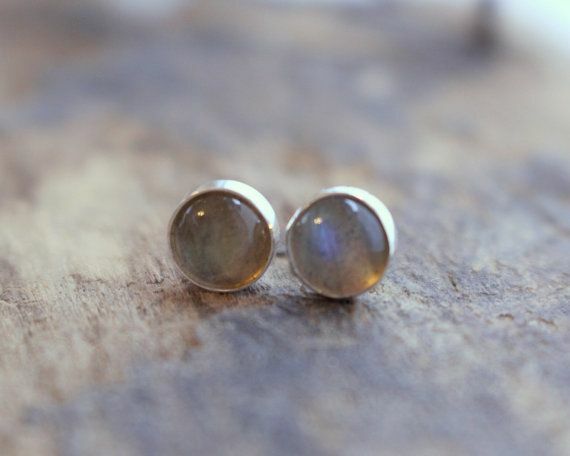 Flashy Blue Labradorite Sterling Silver 8mm stud post earrings. I set a beautiful 6mm smooth labradorite gemstone in a sterling silver bezel with a sterling post. "My name is Jenn and I am the one woman show behind the scenes of MoodiChic Jewelry. I absolutely love that I am able to do what I love for a living and that I am able to share my jewelry creations with the world. I create all my jewelry from my home studio in New Hampshire. I love being able to create a piece of jewelry that someone will wear, treasure and know that a lot of love and time has been put into making it. I am self taught and forever learning all I can about new techniques and designs for my jewelry.I like to create items that are comfortable and fit into everyday life yet are unique."